FRANKFORT, Illinois (Aug. 17, 2016) — Frankfort’s George Schaaf has earned a reputation over more than three decades as one of the nation’s foremost collectors of classic and antique farm machinery. Now, the 83-year-old Schaaf is preparing to sell most of his collection, including a number of tractors manufactured in the early 1900s. Aumann Auctions will conduct the auction on Saturday, Sept. 10 at the Schaaf Truck & Tractor Museum in Frankfort. “I started collecting in 1984 with a couple of trucks and some tractors, and I just sort of got carried away. But now I’m 83 years old, and it’s getting to be about time to let them go,” said Schaaf. 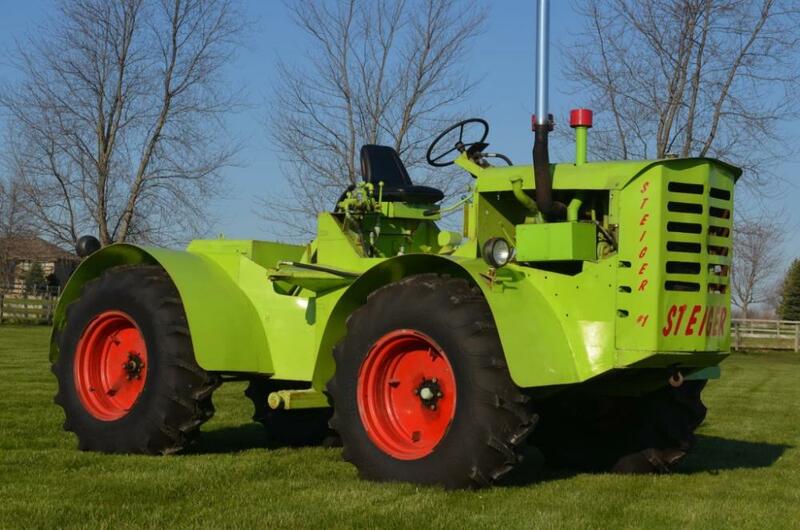 One of highlights of the auction will be the first Steiger tractor ever sold to the public. “The Steiger brothers needed a bigger tractor for their farm, and when they couldn’t find anything suitable, they built one for themselves. This pre-production tractor, which doesn’t even have a serial number, led to the decision to begin production. It’s literally the only one of its kind, and it will be a crown jewel in any agricultural collection or museum,” said Kurt Aumann, president of the auction company. The first Steiger tractor ever sold to the public. Just one of numerous articulated 4WD tractors in this huge auction. “Mr. Schaaf has always had a particular interest in articulated four-wheel drive tractors, and it’s astounding to see the number and quality of those in this auction. Makes like Wagner, Versatile, Oliver, FWD are represented in the auction. There is even a rare Woods & Copeland, which is one of few known. Mr. Schaaf’s restorations on some of the four-wheel drives are immaculate,” said Aumann. The live auction will feature 88 tractors, trucks, wagons, and classic automobiles in all. A complete online catalog with photos and videos of each tractor is available on the website. Prospective bidders may examine the collection from 4 to 6 p.m. at a Preview and Collector’s Social Friday, September 9, from 4 to 6 p.m. The live auction will begin at 10 a.m. Saturday at the Schaaf Truck and Tractor Museum, 22719 S. 80th Avenue, Frankfort, 60423. Individuals seeking additional information and inspections may visit aumannauctions.com or call 888-282-8648. Aumann Auctions, based in Nokomis, Illinois, is a leading auctioneer of farm machinery, land and other high-value assets throughout the United States.